I woke up as late as I could, took a Lyft to the YWCA, and met up with Paul, Madjay, and Michael, for a game of The Deep Forest. Michael had played before, Madjay had played The Quiet Year, and Paul hadn't played any of that jazz. The Deep Forest is a hack of the original map-making game about a post-apocalyptic community, and is instead about a bunch of monsters trying to rebuild after the humans have trashed their lands. Our scenario was an island, where human super-wizards had come and started to colonize with their magics and sorcery, got part-way done, and then left. We had a little abandoned magic metropolis. We had a magic portal that leads to another world. We had a few outposts they had scattered around. We created some monsters: A giant sea kraken that was hanging out near the city port. A group of wraiths who lived in the Well of Souls. A group of gnomes under the big mountain (with one of them "corrupted" by the outside, and therefore our emissary). Judy, a gelatinous cube clear-cutting a patch of forest. Part of the game involves creating Taboos (things the humans left behind that we avoid), but also Adopted things that we've taken on for use. We Adopted the human food: a pen in the city center that magically generates flora and fauna of various types. We try to avoid the Eyes of Loving Safety (which float around all over the island, watching), Common Language (we don't know how to read their stuff), and Wands of Arcane Energy (like dangerous landmines! there's still an eternally burning chunk of forest from the last one we tried to use; the remains of a prior monster included). From there, we started drawing cards and playing. Before long we had a tribe of bugbears invading through the magic portal. We established a small tribe of goblins, who were helping them build a road into the metropolis. That is, until they started eating some of the goblins. The gnomes and goblins didn't get along (as we found through various "discussions") but then suddenly an alliance was made, as the bugbears became more territorial. A giant scorpion thing came out of the ground at one point. Another failed attempt to use a wand resulting in a skyscraper burning. A discovery that the Kraken was eating 90% of our food. The gnomes working on an aqueduct of sorts. The Kraken sabotaging that project by making a dam. A wall around the gnomes as they all "corrupt" themselves with the outside, in an attempt to stave the bugbear invasion. And then the ominous bone golems appearing from the old ruins... as it turns out: our doom as the humans were remotely watching and then taking back control of our world (with the bugbears as their helpers). Normally the game is played with a map, but we played with my Lego Creationary set (an idea I've written about before, and executed a number of times). It doesn't come out too great in pictures, but man is it nice in person... colorful, 3-D map, and so tactile. Now, we played "the fleeting year", which is to say we removed some cards to ensure we had a faster game... but I still never find we finish in the established timeframe. Maybe I'm not keeping the pace fast enough, but still. One thing that Michael suggested during gameplay, as we reached towards the end of session, was a tweak I'm going to incorporate from now on: Instead of ending abruptly somewhere in the middle of the game (if we run out of time), doing a fast forward and taking some cards from Autumn and Winter, to give a more satisfying ending. In our case we chose one card from Autumn and one from Winter, and then ended the game with the King of Spades. I think it would be nice to explore the change in mood a little more significantly. Thing is, it's also important to really establish the setting with the first season as well. Maybe some spread of a nearly full Spring, 1-2 rounds of Summer, and then 1 round of Autumn and Winter for each player. This might provide a more rounded out experience, that you can fit into a 3 hour session more easily. I really dug Michael's tweak of rushing those final seasons! Players of a monster island. From there we were joined by Kit (another one I didn't get to game with, but at least we shared some chatty lovin'), and some of us headed to The Post Brewing Co, and the food was delicious; I ordered a very big breakfast for lunch (which worked, as I only had a weak bowl of cereal earlier). Additionally, at this point I was smart enough to order a flight of beers, which I shared with Paul, so we were able to try a bunch of different flavors. And there was some DJ spinning great funky beats while we were there, so bonus! Ok. Seriously running on fumes here. But... need... more... gaming. I didn't get to play with John yet, and he was running this beauty, also a game I have never played but have heard good things about. Scum and Villainy is a game about a crew of a spaceship trying to keep flying and make ends meet while bending the iron fisted rule of the Galactic Hegemony. Again, we're talking another game that is "Forged in the Dark", so the complexities of the game system (which aren't that huge, but definitely the next level up from PbtA games), had me at a disadvantage. I took the easy route... I wouldn't try to really grok the system too hard. And fortunately the table and the GM made that easy for me. But what happened next took me by surprise: I got to play a fucken Dralasite! Turns out you can play a "Xeno", an alien. So I made a Dralasite mechanic. I can't convey how happy this made me. I barely ever got to play Star Frontiers as a kid, as I was mostly running it for others. I loved the game so much that I've made a whole scenario about it in recent years, just so I could relive that magic, but even then, that's me as a GM. But now I got to play a Dralasite. Seriously. So happy. 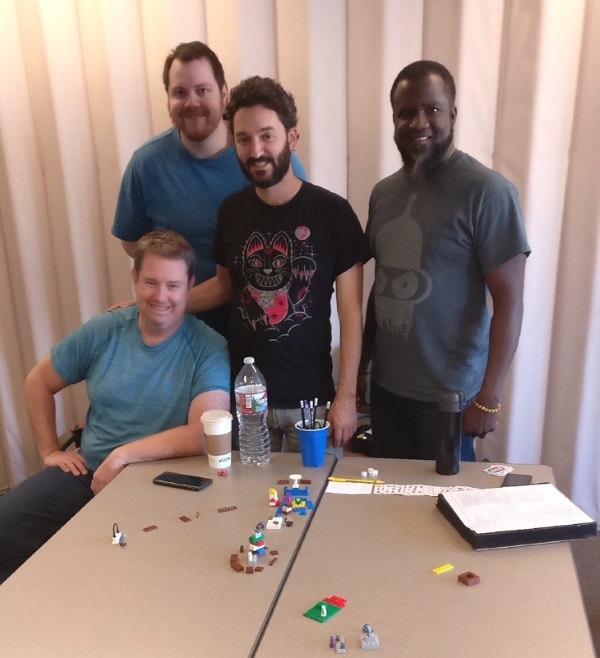 We had Lito Thorn, "Zenith", our Speaker (played by Paul), Ratan Levanchy, "Vandal", our Scoundrel (played by Morgan), Orrin Bartok, "Karma", our Stitch / Medic (played by Jeff? ), and Aria Gyle, "Elbows", our Muscle (played by Michael). We started by creating a shared ship, which was the glue that held this team together, but then immediately found ourselves in a scenario (in media res) where we were in a prison! The first step: breaking the hell out. I got to use my slow shapeshifting powers, which obviously gave me some serious joy. We quickly acquired some decent Stress among the crew throughout our escapades, and then perform some downtime scenes. I would almost say that I was starting to get the mechanics of the game, but that would mostly be a lie. I was brain-friend by this point in the weekend. Also, if you know Paul Beakley on the G+, he has a thread about the con, and there's little bits about these last two games in there (among many other writeups). Go check it out! Headed out to get grub, and we (Cate, John, and many others) ended up at West Flanders Brewing Company. I was trying to be good to my body at this point, and ordered a beet-arugula salad. But that wouldn't exactly be accurate, as we were all sharing so many fried and delicious appetizers, that I really had quite a large and heavy meal. Fortunately I didn't force myself to also eat an entree, as I'd been overeating most of the weekend. The last sessions were fortunately ones which required me to move around. I don't think I would've lasted sitting down at a table at this point. I didn't get much sleep the night before I left for the con, so by now it was 4 days in a row with minuscule sleep. The first game I played was a playtest brought over by Alex for Bully Pulpit, called Underwater People. Basically we were all related to the water (in some way, mer-people, or weird sea creaturs, or even an ocean, itself), and we were going to a support group for sea-things. I was the secretary of the group, a sea slug that used to date Elon Musk, but was dumped after he stole my magic moon pelt, and launched it in a car that's circling the earth. That's OK, I've moved on and was dating someone new. Our president was Sean, playing a human that was pretending to be a sea creature (without any of us knowing it). We had some strange characters, such as the Pacific Ocean (Jerry), and a siren (Krin). Venn and Cate were also in it, and everyone was so... baffling? We didn't really know who each other were, until you started talking. Just like at a real support group. We had hidden cards which described what people needed or wanted (to be listened to, to be pitied, etc.) and if it wanted to emulate some of the possibly strange and tentatively emotional interactions of a support group, well it certainly succeeded! You play until someone leaves, and just over an hour in, that's what happened as our (human) president and the siren went off to, well, hang out, as it were. I don't play many LARP-type things, but have been doing more since last year, and it's definitely a nice mix at a con. I'm currently happy with about 1-2 of these for each large set of RPGs I play. There was one other fantastic piece, which if you are good, I may tell you about one day. Yes, I tease you! Towards the end Andy (who was also my roommate through this process) went off, and came back with a bunch of Shaktilove books, which will be the titles for the games we'll be pitching and playing the next time: The Polarity Process, The Cosmic Serpent, Fierce Medicine, Champions for Peace, The Higher Taste, and of course Psycho-Cybernetics 2000. Stay turned for these marvelous games in coming years. To all the lovely people I got to hang out with this weekend, much much love, and thanks for making such a welcoming and pleasant and superior-fun experience. Peace!